﻿ HuntingNut » Forums » General » General » Starting Fishing Tackle ?? Posted: Tue May 29, 2007 6:22 am Post subject: Re: Starting Fishing Tackle ?? Can't argue with that 'Meatree......as my Dad says...."If it ain't broke, don't fix it". If your kit works well, it should do the same for the young'un. Posted: Tue May 29, 2007 9:25 am Post subject: Re: Starting Fishing Tackle ?? 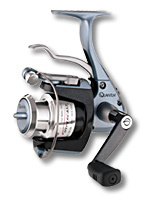 if you are concerned over the ability of casting, pick up one of those trigger style open faced reels, you know, pull trigger, it flip bail open and holds the string, release trigger it releases the line. i have one forget who made it, but it was only like 20 bucks. Posted: Tue May 29, 2007 9:44 am Post subject: Re: Starting Fishing Tackle ?? Never seen one of thouse types of reels sounds interesting. Posted: Tue May 29, 2007 9:58 am Post subject: Re: Starting Fishing Tackle ?? Yeah, it does. Can you find out Morax? I might want something like that for my grandson. My big plan is for he and I to spend absolutely every minute we can outdoors together summer and fall, so I'll probably be looking for more gear. Posted: Tue May 29, 2007 10:10 am Post subject: Re: Starting Fishing Tackle ?? Bottles powerbait (all with glitter! ): Lime Green, Corn, Red, Dark Green, Orange, Rainbow. Spinners: RoosterTail (orange or black), Mepps, Jakes, DareDevil, CastMaster, Rapalas, BlueFox. For trolling I highly recommend trolling WeddingRings behind popgear. Mainly I catch my rainbows / cutthroats on Zekes Cheese, followed by powerbait... then trolling roostertails or Wedding Rings. We went fishing saturday... caught 9 rainbows, most in the 18" range. The largest was right at 20", huge for the lake we were at and they fought like crazy. Posted: Tue May 29, 2007 10:31 am Post subject: Re: Starting Fishing Tackle ?? I don't think I've seen Zekes Rocky Mt Gold, or Sierra Gold cheese, might have though, you know if Cabala's and/or Bass Pro stock the stuff ?? Posted: Tue May 29, 2007 12:21 pm Post subject: Re: Starting Fishing Tackle ?? No they dont. Its hard to find locally so I stock up when I locate it. Google it and you can find some online websites selling it. Looks like they changed their bottle graphics a little from pictures. One thing I LOVE about zekes over powerbait is its much softer. Powerbait tends to get very hard in cold conditions and the fish really have to bite down hard to get hooked. Zekes stays soft and its much easier to hook fish. Posted: Tue May 29, 2007 12:33 pm Post subject: Re: Starting Fishing Tackle ?? Thanks for the link I might just have to get a jar or 2 to try out. Posted: Tue May 29, 2007 5:37 pm Post subject: Re: Starting Fishing Tackle ?? This stuff looks very interesting Dallan, but looking at the pics of it on Steve's Fishing Supplies it seems its only for trout. Never been much for fresh water fishing, have you tried this bait on salt water species? I like the Berkley GULP bait. Does pretty good out here in Australia. I have some Powerbait but it isn't anywhere near as attractive to the fish. Have also tried some artificial bait...mix two parts together that forms an orangey coloured putty....that wasn't too bad, but still not as good as the GULP. One thing I have found though is that you are hard pressed to beat nice fresh natural bait, but it must be really fresh. Never had any real success with plastics, even when coating them with fish attractant, although a little bit of aniseed helps. Posted: Wed May 30, 2007 4:53 am Post subject: Re: Starting Fishing Tackle ?? made by quantum, and at bass pro its a bit pricey, but you can find them cheaper at other places..
Posted: Wed May 30, 2007 8:27 am Post subject: Re: Starting Fishing Tackle ?? Looks interest, that trigger makes it look like one of thouse "upside down" spincast reels. There are other "trigger" spinning reels that you pull the trigger grabbing on top the line with your index finger and it opens the bail for you. I used to have a Quantum like that actually. It broke after many years of good use, then when I went to buy the same model I found out they discontinued all rear drag models, so I went with a Shimano (the only company that Bass Pro had for sale rear drag models, and all of the other fishing stores I went to told me they don't sell them anymore). I like rear drag, lets me play with the drag to suit what ever fish I'm fighting if its necessary so I don't lose the fish. Posted: Wed May 30, 2007 9:47 am Post subject: Re: Starting Fishing Tackle ?? yes i am partial to the rear drags as well, for exactly the same reason, i once lost a beauty of a cat fish cause of reaching in front of the reel for the drag.. but this one i have is rather forgiving..
Posted: Wed May 30, 2007 2:42 pm Post subject: Re: Starting Fishing Tackle ?? Posted: Wed May 30, 2007 2:46 pm Post subject: Re: Starting Fishing Tackle ?? personally I love the push button ones. have had great success when I lived back home and was bringing in big mouth bass, stripers, catfish of all kinds. Ive tried fly fishing now being in here in Montana and go back to my telescopic push button rod and reel. Trout is my fav here to catch. Posted: Wed May 30, 2007 8:00 pm Post subject: Re: Starting Fishing Tackle ?? "Mitri, I have a rear drag reel that is awesome. It is a D.A.M. brand which I think may be German, but it is a great little reel. I also have a Helidon overhead threadline reel that has rear drag, also a great little reel.